Dep Minister Yaakov Litzman gives coalition 1 week to come up with fix for controversial draft law, vows to quit gov't if no solution found. A senior haredi lawmaker has threatened to quit Prime Minister Binyamin Netanyahu’s coalition government in one week if no compromise can be reached regarding a controversial draft law. 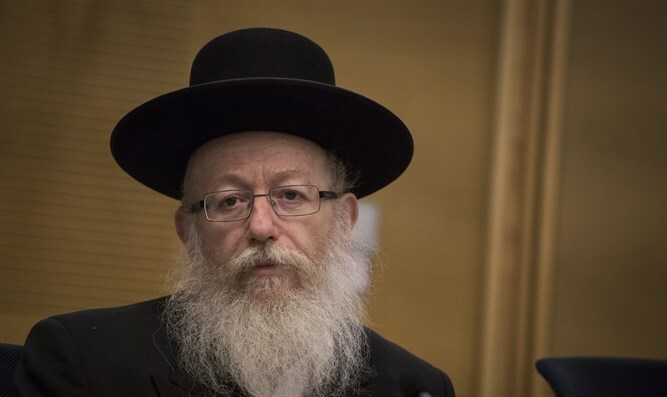 Deputy Health Minister Yaakov Litzman (United Torah Judaism) warned Tuesday that he would resign in one week if the government is unable to secure a delay on the implementation of a Supreme Court order striking down part of Israel’s existing draft law. One of the key issues for Israel’s two haredi parties, the Sephardic Shas and Ashekanzi United Torah Judaism factions, draft deferments have been used to shield religious scholars from the near-universal IDF draft since Israel’s establishment in 1948. While the program was initially limited to several hundred deferments, it expanded through the 1950s and 1960s, before limitations on the number and duration of deferments was dropped under the government of Menachem Begin in the late 1970s. This spring, Shas and UTJ pressured the government to pass legislation circumventing the Supreme Court ruling and reinstating the 2015 law, threatening to block passage of the annual budget bill, thus toppling the government and forcing early elections. While the haredi-backed draft law passed a preliminary vote, it split the coalition government, with Defense Minister Avigdor Liberman’s Yisrael Beytenu faction opposing the bill. In a compromise agreement brokered by Netanyahu, the two sides agreed to push off the second and third Knesset votes on the bill until a committee of Defense Ministry and IDF officials formed by Liberman could offer its own bill. The new law, supported by Yisrael Beytenu and even the opposition Yesh Atid faction, has been criticized by haredi leaders for its sanctions on yeshivas which fail to meet government-imposed quotas on IDF draftees. The bill, which preserves the open-ended system of draft deferments, also places heavy pressure on the haredi community at large to increase the number of haredi draftees. If the haredi community as a whole fails to meet its annual quotas three years in a row, the law is automatically nullified, effectively ending the draft deferment program. While the government has advanced the Yisrael Beytenu-backed proposal, mindful of the Knesset’s upcoming summer recess and subsequent September deadline imposed by the Supreme Court, haredi lawmakers have urged the Prime Minister to request an extension from the court. On Tuesday, sources close to Deputy Health Minister Litzman said that he had been instructed by the Agudat Yisrael faction’s rabbis to leave the coalition if the matter was not promptly resolved. Without an extension from the Supreme Court, sources close to Litzman say, the deputy minister would be forced to bolt the government.